If I were going to spend a weekend in the magical world of Ingary I’d want to travel in comfort. It’s quite far from here so I’d have to think carefully of how I’d make my way. I’d definitely travel by CASTLE. This week we’re going to dip into our Diana Wynne Jones collection and look at that most inventive and smoke-belching mode of transport: a castle, Howl’s Moving Castle, to be specific. [Howl’s castle] suddenly appeared on the hills above Market Chipping, blowing clouds of black smoke from its four tall thin turrets…what made it all the scarier was that the castle did not stay in the same place…You could see it moving sometimes, with smoke pouring from its turrets in dirty gray gusts (Extract from Jones' Howl's Moving Castle, p.2, Methuen, 1986). Inside this Castle that clunks and smokes through the wastes is a rugby-obsessed Welsh wizard called Howl, his fiery fire-spirit Calcifer and the unsuspecting companion in these adventures, the hat-maker’s apprentice, Sophie. This is a story about growing up. Sophie is transformed into an old woman by the powerful Witch of the Waste and leaves the hat shop to find work as a cleaner for the notorious wizard Howl. The castle is where Sophie learns not only about Howl's unwillingness to clean but about her own magical abilities. It may sound cliché but the Castle opened up a journey of discovery for Sophie. In her home of Market Chipping she was a cooperative and compliant young girl who later emerges from the castle as a strong, confident old lady (old until the curse is lifted but still confident). Diana Wynne Jones believed that all children should be encouraged to discover their own individuality, rather than being expected to follow the rules (Seven Stories Moving Stories text panel). Sophie certainly discovers her individuality on the journey and doesn't quite follow the rules. Howl was rumored to be terrifying - probably somebody a young girl should try to avoid and escape not seek employment from. [Howl] was known to amuse himself by collecting young girls and sucking the souls from them. Or some people said he ate their hearts. He was an utterly cold-blooded and heartless wizard and no young girl was safe from him' (Extract from Jones' Howl's Moving Castle, p.3, Methuen, 1986). Sophie was not exactly a young girl, thanks to the Witch's curse, but her physical transformation from young to old mirrors a transformation of character. She grows into a person who is no longer resigned to her fate in a hat shop but who controls her own destiny. It doesn’t exactly seem to be environmentally friendly, but Howl’s Castle allows him to move between worlds. It is his home and his transport. 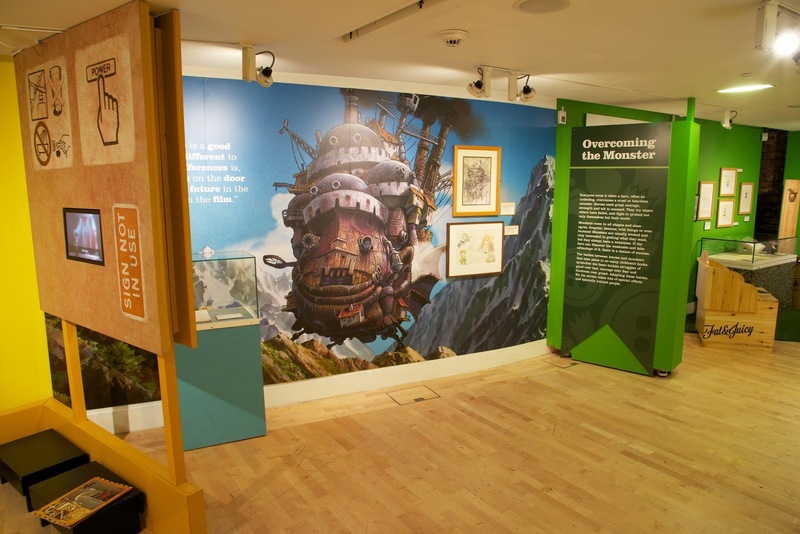 The castle has taken many forms with the Studio Ghibli re-imagining becoming somewhat iconic. Studio Ghibli adapted Howl’s Moving Castle for the screen in 2004. The co-founder of the studio, director Hayao Miyazaki's personal views on environmentalism, pacifism and feminism have a strong influence upon his work. So, a wheezing castle and Sophie's personal journey seem an ideal choice for the Studio however, Miyazaki's adaptation shows significant differences to the book. Prior to the release of the film, Miyazaki visited Jones at her home to watch the film with her. About the Japanese director she said "I don't think I've ever met anyone before who thinks like I do. It was wonderful. He saw my books from the inside out." Diana Wynne Jones is represented in many of our book collections; you can almost always count on finding her name in former public library collections. We have two different versions of Howl's Moving Castle and this cover from the Indonesian edition shows a very different portrayal to the wooden-faced castle of Studio Ghibli. I can understand how a Castle running through the hills like it has spontaneously uprooted and grown legs would have been very frightening to those in the Ingary town of Market Chipping. Jones is widely recognised among scholars, writers and fans of science fiction and fantasy as a truly ground-breaking writer so it's not surprising that her collection is one of our most popular among researchers. In 2014 Seven Stories and Newcastle University hosted a memorial conference for Jones, as a celebration of her work and an evaluation of her contribution to children’s literature, fantasy and science fiction. Archival material in our collection includes stories written by Jones as a child; draft material for 49 published works; material relating to numerous unpublished works; correspondence and fan-mail. Only a small proportion of material relates to Howl’s Moving Castle with two files containing typescript drafts. One of which is a setting draft, marked up with typesetting instructions for the printer. The annotations on this draft mostly refer to formatting amendments for the printers, however some do refer to language use for American editions of the book. This was a joke version of an edited HOWL sent to Laura Cecil by an exasperated Diana Wynne Jones, showing in a reductio ad absurdum version what would happen if she followed Miriam Hodgson’s editorial comments to the letter. Neither Miriam nor anyone else at Methuen knew about this version. It was part of Diana’s way of letting off steam when she was having to fight her corner with publishers. Later on she and Miriam had a very good relationship, but it took some time for her to understand Diana’s work. These changes aren't huge or structural, they don't change the story but their frequency would change the flow of the book. So, this typescript is Jones' reaction to edits that she thought would flatten and oversimplify her language. Judging from her strong presence in our book collections, numerous translated editions and a Japanese film adaptation, Jones' book has clearly had great success without these particular amendments. I may not be able to guarantee that a castle is an efficient mode of transport (with all the billowing smoke and terrified reactions it may not be worth it). What I can guarantee is that Howl's Moving Castle is an excellent read and our collections shed some light on the stages of its creation, and Diana's popularity as an author. I love it! Excellent article. Thanks for the info, you made it easy to understand. Maybe you would be interested in an online service where you can merge any documents you want. I used it to fill out Alto-Merge.